South Carolinians love their barbecue, and Folly Beach is blessed to have access to some of the best in the Lowcountry. From melt-in-your-mouth pulled pork to enormous rib platters, youll find a huge variety of tempting smoked meats close by. 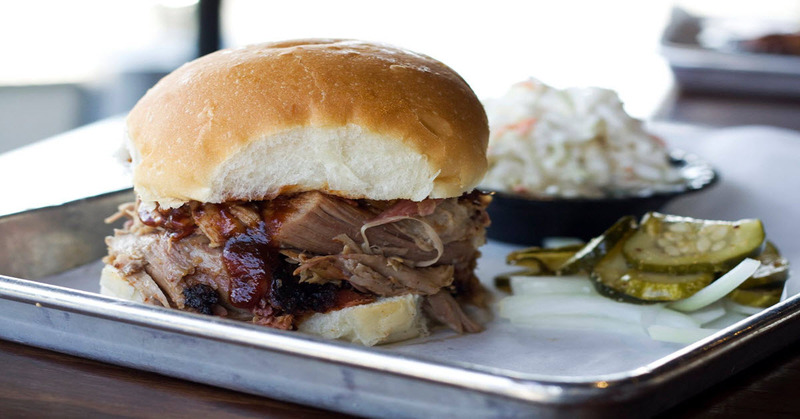 Here is a list of local BBQ restaurants that will have you salivating and begging for more. Located at 1234 Camp Road, this lovely little BBQ joint is just a quick jump from Folly Beach. Boasting over 40 craft beers, Smoky Oak is also one of the premier destinations for chilling after a hard days work. Try the Smoke House Chop Block, with samples of burnt ends, Competition Ribs, pastrami and and smoked turkey before diving into a platter of juicy chicken, pulled pork or dry-rubbed ribs. One of their specialties includes a smoked pork sausage that pairs nicely with their homemade dirty rice and collards. Other options are available for those interested in lighter fare and include hand-tossed pizzas, tacos, sandwiches and salads. Live music plays on Wednesdays, Fridays and Saturdays. Smoky Oak Taproom is open Monday – Sunday 11 a.m. – 2 a.m. The chefs at Swig and Swine are often found at competitions throughout the state and have perfected their unique hickory smoked flavors for their meats as well as their sauces. Located on Savannah Highway in Charleston, next door to the Glass Onion, the restaurant offers convenience and a comfortable atmosphere for sampling their delicious menu. For starters, try their Pork Rinds with Tobasco Honey and Blue Cheese or fried pickles. Order a pickled vegetable jar along with your dinner as the perfect accent with your choice of a vinegar or mustard based sauce. This restaurant offers delicious fare like Pork Belly, pulled pork, turkey and beef brisket with sides of Brunswick Stew and hash and rice to complete the meal. Event catering, such as weddings or pork roasts, are available. Swig and Swine is open Monday – Sunday 11 a.m. – 10 p.m.
Award Winning BBQ found at Home Team BBQ makes the drive from Folly Beach worth it! Head out to their West Ashley Location, located at 1205 Ashley River Road, for a one-of-a-kind dining experience. Besides having some of the best cue in town, they also have some of the liveliest entertainment, with live music events happening weekly and special guests jamming the house. Order their to-die-for wings with Brunswick Stew on the side, then enjoy a combo platter of ribs, brisket, chicken or pork. Smoked bbq tacos are delightful as well, and you will also enjoy the Lowcountry Boil. A smoked white bean chicken chili paired with one of the fresh salads is perfect on a fall evening as well. Enjoy!